The audio of last week’s annual Adrian Leftwich Memorial Lecture is now available online. Listen below to what was a great lecture by Cornell University professor and leading expert on democratic development, Nic van de Walle. Nic spoke on social coalitions and democratic development in sub-Saharan Africa, with particular reference to Barrington Moore’s landmark book The Social Origins of Dictatorship and Democracy (1966). He recast Moore’s work for today’s global economy, explaining why social class and coalitions are key to generating democracy and economic development. 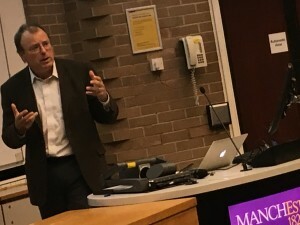 Given the timing of the lecture, to fall one week following one of the strangest democratic elections in US history – in which class and income inequality have been argued to have played a big role – Nic was faced with a challenging task, and had some tricky questions put to him at the end. Queries as to the implications of Moore’s theory that you can’t have democracy without a middle class were particularly pertinent, given rising inequality and a purported shrinking of the middle class in many ‘developed’ nations. What does this mean for democracy in the West, and indeed the survival of the democratic model? Debate as to whether the size and power of the bourgeoisie or middle classes in African countries is underestimated also made for interesting discussion. Do you have questions along these lines? Email them to us via the contact page, or tweet @globaldevinst, including the hashtag #effectivestates, and we’ll do our best to respond. You can also sign up to our email list below for updates on our effective states research. Listen to the lecture. You can also watch it here. This lecture was part of an annual series to remember renowned politics of development thinker Adrian Leftwich.